In the states, Havaianas sandals can carry up to a hefty 40-dollar price tag, as Brazil's prized rubber flip-flops are coveted by those with fashion sense. But in their country of origin (where they probably cost about 3 dollars to make) they go for much cheaper. In fact, this country's famed shoe is a staple in Brazil, one that no beachgoer should go without. That's why a trip to Rio makes it worth stocking up on this trendy beach item at shoe stores, drugstores, supermarkets, and at ubiquitous Brazilian newsstands where piles of flip-flops spill out onto sidewalks. Rio de Janeiro has more than 20 official Havaianas factory stores where you'll find the best selection of styles and sizes. 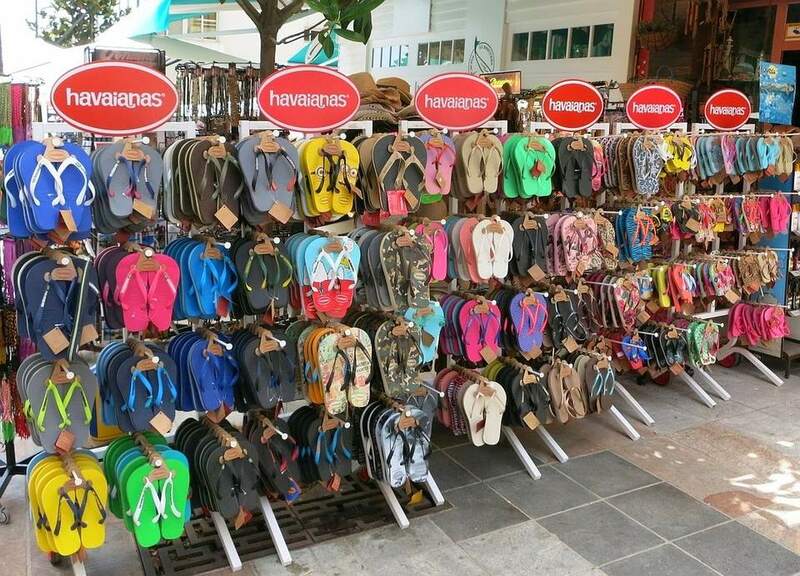 Havaianas stores also stock hard-to-find varieties for kids and men, too. So, if you need to locate that prized pair of sling-back toddler flip-flops, this is where you'll find them. Check out Havaianas Copacabana and Havaianas Ipanema—favorite stores of visiting tourists—where you can have your Havaianas personally customized and bedazzled. If you're the type of traveler who likes to immerse yourself in the local culture, head to the SAARA marketplace in Rio's downtown Centro area. This marketplace boasts over 1,200 stores, covers 11 streets, and welcomes over 70,000 people daily. Shopping in SAARA dates back to the nineteenth century when it first attracted Syrian, Lebanese, Greek, Jewish, Turkish, Spanish, Portuguese, and Argentinean vendors. Later, Korean, Japanese, and Chinese immigrants followed suit, making SAARA known as "The Little UN." MGA Souvenirs (located in the SAARA marketplace) is the premier store where Rio brides buy Havaianas by the bunch to offer as customized wedding favors. While most of the city's stores close on Sunday mornings to observe the traditional Catholic day of worship and rest, butcher shops (which double as mini markets) stay open. And you bet they carry Havaianas for harried beach visitors. In fact, just steps from the beach, KiKarnes does just that. So, stock your beach cooler full of beer, snacks, and fresh fruit, and then grab yourself a pair of flip-flops on your way out the door to enjoy a day in the sun. Many Rio department stores offer a good selection of Havaianas sandals. And the chain Lojas Americanas (which means "American Stores")—with shops throughout the city—is your best bet. The stores in Copacabana and other touristy areas fully represent the brand, similar to shopping in one of the factory shoe stores. In Rio, newsstands (or bancas) are not just for news. These sidewalk shacks sell everything from magazines to cigarettes to chocolate. Nestled in a corner or in an overflowing basket on the street, you can probably find a meager selection of Havaianas flip-flops suitable to those who need grab-and-go comfort for the beach. But if you're looking for a certain style or want to pick some up for the kids, head to a department store or factory store instead, as newsstands usually carry only one model.